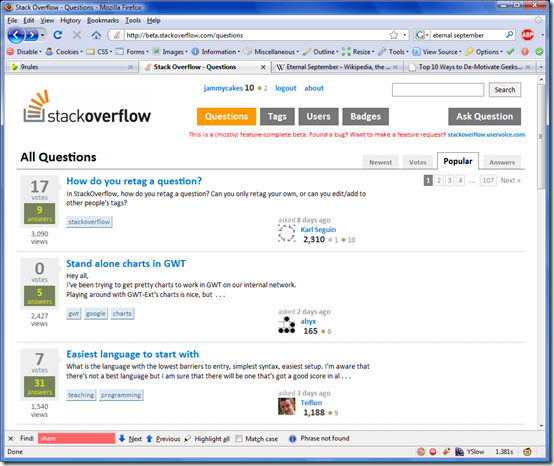 I’ve been checking out the private beta of the new Stack Overflow website from Jeff Atwood and Joel Spolsky. You need to sign up for an invitation if you want to get involved with the beta, and they’re only sending out a hundred or so invitations a day, so you may have a bit of a wait, but from what I’ve seen it looks fairly promising. The concept is fairly simple: it’s a programmers’ question and answer website, a bit like a cross between Yahoo Answers and Digg. You can vote answers up and down, with popular answers appearing at the top and useless answers falling to the bottom. This means that it should help to filter out answers of the type “I’m having the same problem too” which render Google search results for pretty much 100% of the problems you encounter in software development totally useless. However, it is not well suited for discussions — there are some questions where people have been posting answers in response to other answers, but it can be a bit difficult to follow the thread of the discussion. Another interesting twist, however, is that you can vote questions as well as answers up and down. This is based on the premise that the old adage “There are no stupid questions” is wrong. This is a common sentiment in geek — especially hacker — circles, and I have mixed feelings about it. Yes, vague and misdirected questions can be an irritation, but they usually come from newbies who don’t know any better, and highlighting newbies’, er, newbie-ness, could be a bit off-putting to them. Having said that, it could — and probably will — work out fine, but the site may need some kind of equivalent to the Wikipedia policies of “Don’t bite the newbies” and “Assume good faith” to avoid the hacker types from getting too carried away with themselves there. You can also earn “badges” and reputation points, for a whole lot of things such as answering questions, getting a certain number of votes on your answer or question, or having your answer judged as the best one by the person asking the question. You need a certain number of reputation points in order to do certain things — for example, you can only vote questions and answers up and down if you have 25 or more reputation points. At the moment, there are just under a thousand users on the site, and since it’s populated by the kind of people who have actually heard of Joel Spolsky and Jeff Atwood, the questions and the answers are on the whole pretty smart ones. How much this changes in a month’s time or so when it opens to the public and its eternal September gets underway, remains to be seen. There is always the possibility that it will see an influx of the kind of morons that hang out on Digg, or people asking questions such as “Help, I deleted the database and we didn’t have a backup, how do I get it back before my boss finds out?” but hopefully the moderation system will keep it on track, mitigate that, and preserve the flavour of a community of developers who actually know what they are doing and can give constructive answers to questions. Posted at 22:09 on 10 August 2008. « PHP gets closures. Rejoice!